This text book provides the theoretical background of rock fracture mechanics and displacement discontinuity methods used for the modelling of geomechanical problems. The computer program FRACOD is used to analyse the fracture problems, assessing fracture initiation and propagation in tension (Mode I), shear (Mode II) and mixed mode I and II of solid intact or jointed geomaterials. The book also presents the fundamentals of thermo-mechanical coupling and hydro-mechanical coupling. Formulations of multiple regional mechanical, thermal and hydraulic functions, which allow analyses of fracture mechanics problems for structures made of brittle, rock-like materials, are provided. In addition, instructive examples of code verification and applications are presented. Additional material: The 2-D version of the FRACOD program, a manual on the program and a wealth of verification examples of classical problems in physics, mechanics and hydromechanics are available at A large number of applications related to civil, mining, petroleum and environmental engineering are also included. - Ki-Bok Min, Department of Energy Resources Engineering, College of Engineering, Seoul National University, Korea. “Challenging rock engineering applications require extreme conditions of stress, temperature and hydraulic pressure resulting in rock fracturing to a various extent. 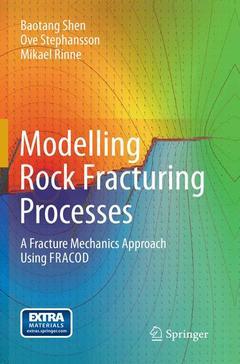 The FRACOD is one of few computer codes available in engineering rock mechanics that can simulate the initiation and propagation of fractures often interacting with natural fractures. Its capability has been significantly enhanced to include the hydraulic and thermal fracturing with concerted interaction from multi-national research and industry partners. My experience with the FRACOD is very positive and I am certain that its already-excellent track record will expand further in the future."